We propose a globally divergence conforming discontinuous Galerkin (DG) method on Cartesian meshes for curl-type hyperbolic conservation laws based on directly evolving the face and cell moments of the Raviart–Thomas approximation polynomials. The face moments are evolved using a 1-D discontinuous Gakerkin method that uses 1-D and multi-dimensional Riemann solvers while the cell moments are evolved using a standard 2-D DG scheme that uses 1-D Riemann solvers. The scheme can be implemented in a local manner without the need to solve a global mass matrix which makes it a truly DG method and hence useful for explicit time stepping schemes for hyperbolic problems. The scheme is also shown to exactly preserve the divergence of the vector field at the discrete level. Numerical results using second and third order schemes for induction equation are presented to demonstrate the stability, accuracy and divergence preservation property of the scheme. 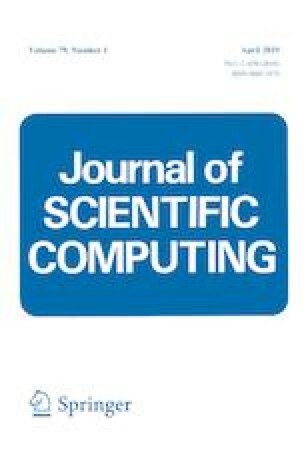 The author would like to acknowledge the support received from the Airbus Chair on Mathematics of Complex Systems established at TIFR-CAM by the Airbus Foundation for carrying out this work. The author also thanks Dinshaw S. Balsara for many discussions which were helpful in formulating these ideas. Finally, the author would like to thank the anonymous reviewer whose comments helped to improve the presentation of the paper.